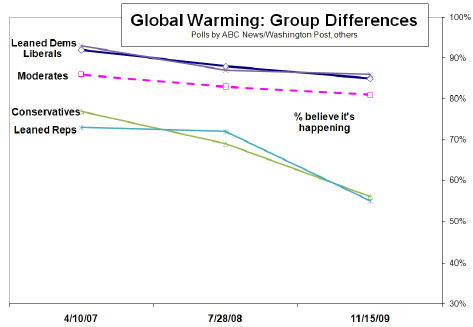 ABC News reports that in the past 16 months the number of people who believe in global warming has dropped 8 percentage points. But the drop is skewed almost completely by ideology: among liberals and moderates there’s been a change of only a couple of points, which might just be statistical noise. Among conservatives, belief in global warming has dropped a whopping 13 points. Note that this isn’t a drop in conservatives who think that global warming is manmade. It’s not a drop in the number who think it will continue in the future. It’s not a drop in the number who think it’s too expensive to do anything about it. The question ABC asked was whether or not temperatures had increased over the past hundred years. It’s a simple factual question like asking if the Allies won World War I. But only a bare majority of conservatives believe it. It’s Jim Inhofe’s party now.